Our financial planning process is the DBT360, named for how we see our role in our clients’ lives. We stand with you and then look from the inside out, on all sides, and with all risks and resources accounted for. The first stage of planning in the DBT360 begins with a simple question: “How can we help you?” The answer, however, is deliberately not so simple. We begin by determining what goals a new client has for both the near and distant future, and dive deep into how he or she can blend financial intentions with personal dreams in order to set a course for our planning. Often, clients are surprised to learn that they are closer than they thought, but lack the appropriate focus to get there. Others find that their priorities do not match their current path. But clients benefit from a clear inventory of where they are and an evaluation of where they want to be. This is their Purpose. Once a new client has determined what they want to achieve, the DBT360 planner begins a thorough analysis of the resources available to start the journey. More than just a review of bank accounts and pay stubs, this stage evaluates current and possible investments, occupational growth opportunities, and family wealth and “windfall” expectations. With years of experience working with small business owners, the planner also analyzes business models and projections to determine other unique paths to financial growth. This stage of the process forms the building blocks for the plan, and these blocks fit together as the client’s Potential. We know that financial plans are affected not only by financial market booms and busts, but also by life, which happens when you least expect it. Our plans are not complete without a comprehensive risk analysis to identify where the strategies can be pushed off course. We have navigated new and unexpected waters for hundreds of clients, and we rely on this experience to forecast obstacles that can limit the expected Potential. The DBT360 plan reviews a client’s present debt, as well as future borrowing needs, in order to identify possible leaks. Professional and personal challenges, ranging from industry-specific threats to family health or dependent issues, are the Pitfalls that must be considered as part of any planning process. 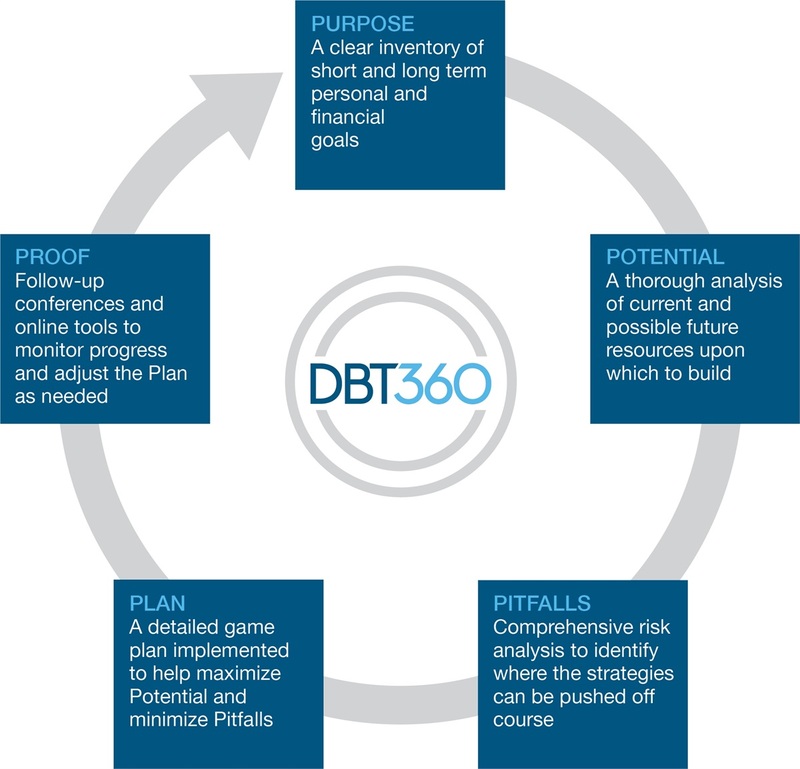 The DBT360 plan provides the matrix for a client to either accept, eliminate, or mitigate these Pitfalls. Once we’ve analyzed the Potential and the Pitfalls, we generate and implement the Plan: a detailed game plan that considers a variety of strategies, which need to cross the finish line at different times, to best reach a client’s Purpose. A CERTIFIED FINANCIAL PLANNER professional will offer personalized investment recommendations that balance available resources with risk tolerance. Where appropriate, various insurance programs may be incorporated to mitigate or eliminate potential Pitfalls discovered during the process. Working with outside estate attorneys and tax professionals, a suitable estate plan can be developed to seamlessly integrate with the DBT360 goals and offer a comprehensive solution for clients. The DBT360 process does not stop when the ink dries. Our office stands behind the work we produce, and continues to review and monitor a client’s progress at least annually. Our clients can view their plan and the current status of their entire financial picture at any time through our online financial platform. We also meet with our clients for a status conferences to review changes, celebrate goals achieved, and to reset or restructure strategies if priorities have changed-, the Plan adapts as life progresses. The Potentials become realities, the Pitfalls disappear (or return! ), and the Purpose may change or expand. Then we can stand beside our clients and know that they have confidently made the best decisions they could make for themselves today. Contact us at 214-764-1977 to get started with your DBT360 Planning.